Question 2: I would like you to know that people in our country are looking forward to hearing what you have to say. You have many friends; and I am sure the veterans constitute the largest army among them. I would like you to take this opportunity to congratulate the war veterans from here, from Damascus, from Syria, those war veterans, the Belarus popular defense, who experienced all the calamities of war. For all those who are watching you today, what do you want to say to them? President Assad: This is a very good opportunity for me to congratulate the veterans of the Belarus army, the Belarus people and state led by President Lukashenko. For us, those veterans who fought in that ferocious war – and the Soviet Union made great sacrifices, for it offered over 26 million martyrs, and as far as we know the number was closer to 30 million – were the main force; and today they offer a role model for the present generation and for future generations. They provide a role model of resilience and standing fast. Who could expect the siege of Stalingrad at that time to end the way it did without the steadfastness of those heroes? Who could expect that the initial retreat of the Soviet army would turn into a victory later? Without the victory of the Soviet Union, the Normandy landings for Western states wouldn’t have been possible. This is what many in the West are trying to obscure, i.e. the more important role played by the peoples of the Soviet Union at that time – including your people – in defeating Nazism. Today, these veterans play a vital role in strengthening the spirit of steadfastness, because you too are facing something similar to what Syria has been facing for decades. You are under siege, and President Lukashenko is facing demonization attempts, the same thing faced by President Putin recently, because they do not bow to the West. If past generations did not bow to Hitler, the present generations should not bow to the new Nazism, i.e. Western colonialism in its newest form in our age. Question 3: Thank you very much for your congratulations, and now can we move to events in Syria? I cannot understand the factors behind your people’s resilience, particularly if we wanted to compare this with what happened in Iraq and Libya. The inventors of new ideologies, the organizers of velvet revolutions are still trying. What does make your people so resilient? President Assad: There are a number of factors: first, Syria is an ancient country, and now you are in Damascus. Damascus, and Aleppo in the north, are the oldest continuously-inhabited cities in history. Nobody knows when life started in them. This means a historical accumulation for thousands of years. If you go back to written history, since writing was invented, you will see that Syria has always come under different forms of occupation and different forms of colonialism. It was invaded and destroyed. This means tht tahe Syrian people have accumulated experiences in how to deal with historical campaigns. So, what’s happening now wasn’t surprising to the Syrian people, for all the lies which were promoted in the beginning were clear. Second, the Syrian people are a patriotic people, but in a completely different sense than the one promoted by the West in the beginning, when it started to incite war in Syria by using sectarian terminology. The West wanted to create a problem among the Syrian people who have not known sectarianism for centuries. When the West made this “stupid step,” the result was that the Syrian people became more united in order to save national unity. Third, if you are comparing what happened in Syria and what happened in other countries, there is something else, which is the nature of the relationship between the state and the people. The West has tried to cast this war as one fought in order for the president to keep his position, while the Syrian people were aware that it was a war over Syria. For us, and for me personally, I have always been, before the war and during it, one of the sons of the Syrian people. I haven’t lived in separation from it. Had the Syrian people felt differently, that this president or this official is fighting battles for his personal interests, they wouldn’t have supported him for one single day. The West did not understand all these things because of the shortsightedness of its officials. That’s why, so far, they have made a lot of destruction in Syria, but they haven’t been able to achieve what they planned in the beginning, i.e. that all the Syrian people would come out on the streets in support of the fake democracy they claim and the fake freedom they promote in order to realize the Syrian paradise, as portrayed by the West, after the fall of the present state. All these things were clear to the Syrian people; and that’s why the West has failed in realizing its plans. And this shows that the West, despite all the advance it has made, does not have an in-depth understanding of this region. The West is used to a group of lackey officials who ingratiate themselves with it for their personal interests. When it comes to the real state of patriotism, as in the deep and accumulative social concepts in this region, Western officials do not understand this at all. That’s why they failed. Question 4: Something that a lot has been said about recently, and I can’t but raise, is the chemical attack in Idleb and the missile strike which targeted al-Shairat airbase. Who did that? What was the nature of the event? And who stands behind it? And do you think that what happened was only one link in a single chain of events? 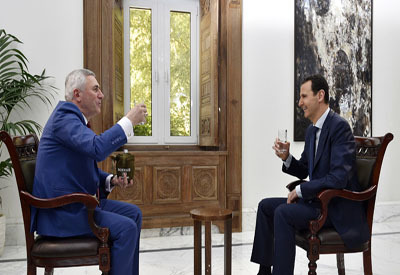 President Assad: Of course, it was part of the campaign waged on Syria with the aim of demonizing the Syrian state. In the initial stages of the war, they tried to promote this demonization among the Syrian people, i.e. convincing the Syrian people that their state is bad. They were able to deceive a section of the Syrian people for a few months, and maybe for a year; but afterwards, they couldn’t do that, so they shifted towards convincing the Western public opinion in order to garner support for intervention and waging war. After they failed in marketing their policy towards ISIS and al-Nusra through their support of these two organizations directly or indirectly, through Turkey, Saudi Arabia, or Qatar, or as I said through direct support from their states, they wanted to wash their hands of the subject and to show that the problem in Syria is not ISIS and al-Nusra but the state which is killing its innocent citizens by using toxic gases. It was also a cover for the American intervention in Syria, because as you know Trump is facing an internal predicament and internal conflicts within his administration. He also has conflicts with other forces and lobbies in the United States, with the media, and the large corporations. So by doing that, he wanted to present his credentials to these groups. The chemical attack issue is also a justification for this intervention. It is a planned process which is intended to achieve a number of objectives at the same time. They refused to conduct investigations. Russia and Iran presented a draft proposal to the Organization for the Prohibition of Chemical Weapons (OPCW), and they refused to approve an investigation, because it will prove only one thing, that they were lying. Question 5: How are things on the battlefront? Who is the army fighting against? Against the opposition, ISIS fighters, or against foreign powers? President Assad: In fact, we cannot separate all these groups. ISIS and al-Nusra have the same Wahhabi ideology and the same terrorist doctrine. ISIS, al-Nusra, and Erdogan – who is affiliated with the Muslim Brotherhood – Al Saud, and Al Thani in Qatar uphold the same doctrine. All these groups have something in common which is the extremist Wahhabi ideology. And all of them are instruments in the hands of the United States. I’m not saying that they are instruments in the hands of the West, because Western Europe doesn’t practically exist on the political map. Europe implements what America wants, without any objection. All of these groups operate under the American leadership. So, whether we say that they are foreign powers, ISIS and al-Nusra, or others, the director and financier is the same. They are all one group but with different names and different tactics. Question 6: My Western colleagues have a lot of accusations against you and say that Bashar al-Assad is a dictator. Now I’m sitting with you and looking at a highly-educated and gracious man. I can even say that you are a modest person. I would like to tell you that I am in Syria for the fifth time, and I have moved around and talked with simple people. The most important thing, in my view, is that I found they respect and trust you. Tell me honestly, aren’t you tired of all this dirt that’s thrown at you? Can you sacrifice some valuable things for the sake of your country and its future? Or do you think that you have no reason now to step back, and that you have to go through to the end? President Assad: As to feeling tired, I believe that they feel tired. I don’t. They are tired of the numerous lies that have not produced any results. On the other hand, this is positive, because as far as Western policies are concerned, when they describe a politician in another country negatively, it means that he is patriotic, because their standards for democracy, for example are represented by Al Saud, their close friends. They never say a word about them. This is just an example. As you know, the West has supported Saudi Arabia recently to be in the UN Commission on the Status of Women and the UN Human Rights Council. So, only when the West talks positively about me, should I be in a confused state, and that will not make me comfortable at all. These accusations used against me now were used for many years against President Lukashenko because he stood against the West and did not accept to be an agent. This is the West, and we should not pay any attention to what they say. What’s important is the relationship between the official and the people of his country, not with Western media or Western officials. I’m not concerned with what they say about me, negatively or positively. A few years before the war, they used to speak positively about me. At that time, I did not care because I don’t trust them. I know them very well. They are hypocrites, and this is the truth. Question 7: You spoke very wisely when you said that it is the trust of your people that you highly appreciate. Do you agree with me that the opposition is also part of your people, and when you conduct dialogue with them, you talk about the future of Syria. What’s your view on that? There were the Geneva meetings and then the Astana meetings. Are there differences between these meetings? And what are the results they both produced, mainly concerning the relationship with the opposition? 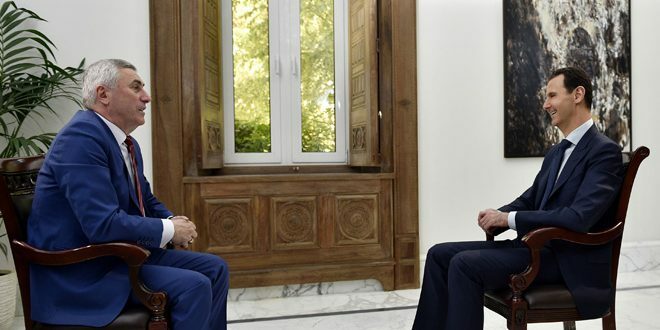 President Assad: As to Geneva, so far it is merely a meeting for the media. There is nothing substantial in all the Geneva meetings. Not even one per million. It is null. The process aimed in principle at pushing us towards making concessions. You asked me about concessions in a previous question, and I did not give you an answer, and I’ll keep it bracketed. No, I will not make any concession, and for a simple reason: I do not own this country. Any concessions on the national level are not the prerogative of the president; they need a national decision and a popular decision, and this happens through a referendum. All the things related to sovereignty, national interests, the constitution, and independence are not the prerogative of the president and he cannot make concessions regarding them. I make concessions on personal issues which are of no importance to the people, the crisis, and they are not required of me anyway. As to Astana, the situation is different. In Astana, the dialogue was with the armed terrorists under Russian sponsorship and based on a Russian initiative. Iran and Turkey joined later. Turkey is the terrorists’ guarantor and Russia and Iran are the guarantors of the legitimate Syrian state. This started to produce results through more than one attempt to achieve ceasefire, the most recent of which is what’s called the de-escalation areas. Journalist: Can we understand what they signify? What is expected from these areas? President Assad: These areas include a mixture of civilians and terrorists. The terrorists are a mixture of al-Nusra, ISIS, other organizations, and some gangs. The objective is in the first place to protect the civilians in these areas. The second objective is to give the interested rebels an opportunity to reconcile themselves with the state, like what happened in other areas. So, de-escalation in these areas is an opportunity for them to settle their status with the state, i.e. they lay down their weapons in return for amnesty. It is also an opportunity for other groups which want to expel the terrorists, particularly ISIS and al-Nusra, from these areas. So, they have a number of aspects, but the most important for us is to reduce bloodshed in those areas while waiting for internal political steps between us and the groups operating in those areas. Question 8: So the memorandum signed in Astana concerning the de-escalation areas can be considered a big success so far for the negotiations? President Assad: Of course. As a Russian initiative, it is correct in principle. And we supported it from the beginning because the idea is correct. As to whether it will produce results or not, that depends on the implementation. Would the terrorist groups use this opportunity? Would the other states, particularly Western states, which claim to support this initiative, send more logistic and financial support to these groups? And would they send more weapons and recruits to those terrorists to enable them to violate these areas, and return the situation to square one? This is very likely, and this is what happened before. Former initiatives failed not because they were wrong. They failed because those countries interfered in order to re-escalate militarily. That’s why we hope that this will give an opportunity to those states to realize that any escalation will fail, because the Syrian and Russian forces, with the Iranian support, and with support from Hezbollah, will strike any move on the part of the terrorists if they attempt to violate this agreement. Question 9: Concerning these security zones and the crossings through which you will allow the rebels to move to other parts of Syria. You no doubt heard that many international organizations accuse you of ethnically-based human rights violations, or that you are displacing people. On the other hand, there are those who see in it a first stage towards partitioning Syria. How do you respond to such statements? President Assad: This is an attempt at inciting some naive people in Syria, that demographic change is happening in Syria. This is untrue, and most Syrians know it is not. If you visit most of the areas where reconciliations have been achieved, you will find that the population is there. So, why do we displace people from one part and keep them in another? Why don’t we ask everybody to leave these areas? In fact, the Syrian state does not force anybody to leave. Reconciliation gives the choice to the people of the area, whether they want to leave or remain. It also gives the choice to the rebels who can stay if they wanted to lay down their weapons and settle their legal status, or leave if they don’t want to do that. In fact, most of the rebels who leave are those who reject reconciliation. And the civilians who leave with them are their families. They leave together. The state does not ask anyone to leave. Second, if the state wants to effect demographic change, why doesn’t it bring people from other areas to settle them in the place of the original population? The areas whose population have left as a result of terrorist acts are still empty up till now. Nobody at all lives there, and the properties there are still registered in the name of the original population or owners. So, this is completely untrue and has no value whatsoever. Question 10: I want to move to the question of the refugees. It is a painful issue, and unfortunately the number of refugees during the past six years has been very high. In your view, to what extent is Syria prepared for their return? How can you accommodate yourselves with the economic results of this war waged by global terrorism against you? Do you think that you can lodge complaints, prosecute, and ask states – among them some European states – whose representatives have invaded your holy Syrian land for compensation? President Assad: The return of the refugees is necessary; and we always call on the refugees to return to Syria. As to the timing, every time is an appropriate time for any group of refugees to return. There are no obstacles in this regard; and the state is trying its best to provide the necessary services for those who are displaced inside Syria, and not necessarily outside Syria. Many of them changed places because of terrorism, and the state will provide services in this regard with support from friendly countries in the humanitarian field. As to demanding rights, there is no doubt that the Syrian people have the right for compensations worth hundreds of billions. But as you know, these compensations need a legal and institutional framework. Imagine that you have a certain right in your country, but you don’t have – in Belarus, for instance – neither laws nor judges nor courts. Who do you complain to? In that case, it will be chaos. This is the reality of the international situation: there is no frame of reference, no respect for international law, and no fair and impartial institutions. There are institutions which are arms of the American state department which will not return rights to their owners. That’s why it is not possible practically to get results in this regard. In general, we don’t need them now. We can build our country using our capabilities. Syria, throughout its ancient and modern history,has been built by Syrian hands, not foreign ones. We have the capabilities to rebuild our country. Money will come gradually. The refugees will bring their money back, and things will move ahead. We have no concerns about this, for we don’t need money from those states or those officials who supported terrorism and bloodshed in Syria during this crisis. Question 11: I cannot but touch on the issue of Deir Ezzor. It is now the main target of the Syrian government. Why does the whole world turn a blind eye to what is happening there? After four years of being besieged by ISIS, there is famine and destruction, and what’s more horrifying is that children and simple people are dying. Look at the humanitarian aid provided by the 124 states of the world. According to information I’m sure you have, they support the rebels, and throughout the past four years, they have not dropped from the air one single loaf of bread despite all the humanitarian aid. There are 200,000 people who need bread and water as much as they need air. 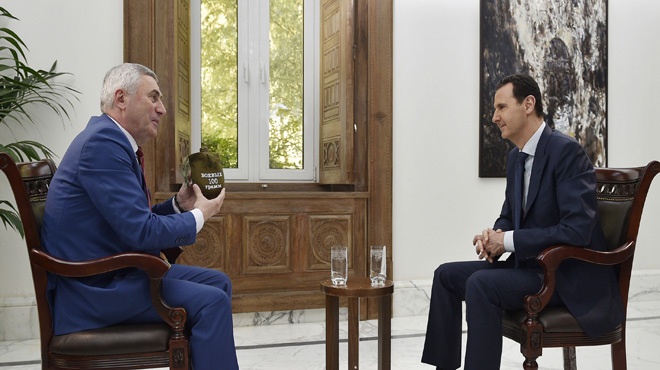 President Assad: The reason is that global politics are not governed by principles and morality. They are governed by interests, even if they were at the expense of moral values, and often at the expense of principles and international law. Now, there is a group of colonial states which are not governed by principles at all. A large number of those states know this truth on the official and popular level, but they dare not say this truth because they fear the West. However, there is a group consisting of a few states which say the truth as it is and take a principled and moral position, including Belarus, Russia, Iran, and North Korea. Because these countries do not do the West’s bidding, they are called undemocratic or members of the axis of evil, or as I said a short while ago, are described negatively. But these are the only states which dare say the truth. This is the reason why you hear very little about groups consisting of hundreds of thousands of innocent people besieged somewhere and nobody talks about them. Conversely, when the terrorists in Aleppo hijack a part of the city with its population, and kill people in the other part with daily shelling, nobody says anything about it. This doesn’t concern them. They defend the terrorists. And when we liberate this city of the terrorists, it is a violation of human rights because for them the terrorists are the humans, and all those who are not terrorists do not exist neither on the political nor on the humanitarian map. Question 12: I totally agree. During my visits to Syria, I met the Grand Mufti, the Patriarch, and representatives of other sects too and found that all of them want peace, national unity, and solidarity. All of them support their country. Why nobody wants to hear what they have to say? Many people do not even want to know the truth of what is happening in Syria. Do you agree with me? President Assad: Most Western officials know the truth, but they have gone too far with their lies. They have implicated their public opinion, and it has become difficult for them to do a U-turn, because any U-turn means that they acknowledge to the public opinion that they were lying. That’s why they have squeezed themselves into a tunnel and cannot return. They have now to persist in their lies because they are their only option. Any U-turn or shift constitutes a political suicide for them; and their political interests are more important than national interests and more important than the interests of other nations and the lives of other people. Question 13: I want to move to Syrian-Belarus relations. Our relations, spanning decades, have reached a very good level. You know the official position of Minsk in support of peace and national and popular unity in Syria, the position that has always condemned global terrorism which interferes in your internal affairs and that media war waged on you unfortunately by Western states. What is your review of Lukashenko, considering that Belarus too was subjected to economic sanctions repeatedly and faced baseless criticism, but Lukashenko was able to deal with this. An important case in point is the Ukraine, and you can see that Minsk has now become the only platform where all parties try to reach an agreement to achieve the peace which they have waited for so long in the Donbass region in the Ukraine. Don’t you believe that Lukashenko may be able to intervene in the proceedings of the political solution for your country? President Assad: Any solution to any problem needs a number of characteristics or elements, but the most important element is credibility, which you have. You belong to a country which has credibility, because what the Belarus policy is saying today is the same that it said at the beginning of the crisis. They are the same principles it was based on concerning other issues. The principles on which this policy is based regarding Syria are the same principles on which it is based concerning the interests of the Belarus people and the interests of Belarus. They are the same principles which inform the role it plays in the Ukraine. It is a stable policy that has a clear vision and clear principles that do not change. This is essential for playing a role in any crisis. And this is what we need in Syria. Why is not the Syrian crisis solved politically? Because those who are supposed to play that role, with the exception of Russia and Iran, are states which have no credibility. They say something and do something else. Double standards are a basic principle in Western policies. So, this is the most important element that President Lukashenko and the Belarus state have. In addition, we as a state have a strong and solid relationship with Belarus, since the days of the Soviet Union and after. And it is still there, despite all the pressures on your country and on Syria before the war. This relationship continued regardless of Western desires in this regard, and is based on common interests. In this regard, President Lukashenko was a patriot, was truthful, and courageous. With all these attributes, I can say that Belarus can certainly play – beside Russia as a major player on the international arena concerning Syria – a vital and effective role. If Belarus has the desire, we strongly welcome any role it can play in the current war. Question 14: Thank you for these words, and I want to ask about our economic relationship. I understand that the war has been going on for seven years, and there’s great destruction, but all of this has to be rebuilt one day. Do you know that Belarus has great capabilities in this regard? We remember that the first Belarus-made truck, manufactured by MAZ, appeared in Syria. And I also remember that when you visited Belarus in 2010, you drove a MAZ vehicle. When can we see these cars and trucks on your roads? President Assad: In my last visit to your country, a few months before the war, there were broad-ranging economic agreements between us. The war came and obstructed everything. But recently, and after meetings held by the joint Syrian-Belarus committee, and after a visit paid by the Belarus co-chair of the committee and his meeting with the Minister of Industry a few weeks ago, some aspects of that agreement were reactivated and a number of deals benefitting the two parties were agreed. I do vividly remember my visit to the factory at that time, and we did hope to start producing that car in less than two years. That was delayed because of the war, but recently we reactivated that subject, and export will start in the next few months. The first shipment of car parts will be exported in order to be assembled in Syria. So, despite the difficult circumstances that Syria is going through, and despite the sanctions against Belarus, and as a result of our strong will, we have been able to reactivate these relations. And this is the beginning, of course. Many of the areas we talked about before the war can be reactivated despite the security conditions in Syria. We do not have to reactivate all areas, but we can do that with a significant part of the agreement. This is what we are trying to do now, and the wheel has started moving recently. Question 15: At the end of our interview, I believe that Belarus has economic capabilities. And it’s important that the Syrian people and the president have the desire to build relations and friendship with us. This is equally important, and I believe these relations and this cooperation have a great future. In the end I want to say that I have known Syria for a long period of time. This war that you have been fighting for seven years contributed to unifying your society. I recall the Syrians as quiet and polite people. They distinguished themselves among Arab peoples by their tolerance, good will, and hospitality. You haven’t lost all that despite the pain and the tears. And I’ll tell you that you personally have been a role model for unifying society. I travel around the world, and I have many Syrian friends. Today, there is no Syrian family that does not have a Syrian flag at home. This is what has unified or integrated the whole society in one melting pot. I want you to know that on behalf of our people and on behalf of Belarus, I wholeheartedly wish your state peace, prosperity, and unity so that you can keep moving forward, and so that the mothers who have buried their sons do not have pain after now. I hope that everything will keep moving as we have seen throughout history so that life continues and Syria remains as it has always been, the cradle of civilization, and to remain prosperous. This is what we genuinely hope. 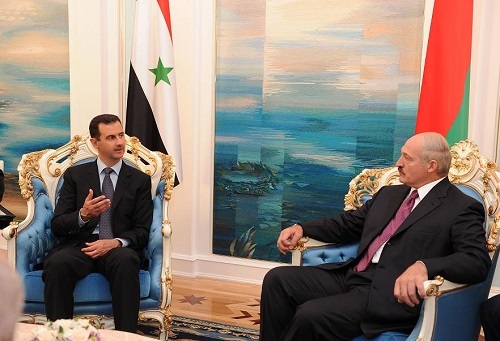 President Assad: Thank you very much for all your kind words about Syria and the Syrian people. One of our most important attributes in Syria is loyalty, loyalty to all those who have stood with us in difficult circumstances, and this is what Belarus has done. I thank every Belarus citizen for what they have done for Syria, because the net outcome of this support is the decision taken by the president, for the Belarus president cannot support Syria without having popular support for this policy. We take every support, every word, and every political position that the Belarus state has taken on all levels as an expression of the reality of what the Belarus people think and feel. I hope the Belarus people will achieve another victory in a different form. War doesn’t always have to be in the military field. The Belarus people have been facing that war for over two decades now. I hope that they will achieve another victory in that war, in lifting the sanctions and enshrining the patriotic state and forcing their respect particularly on those who want to dominate your country. And I hope it will coincide with Syria’s victory in its war against the terrorists, because for us it is also a national war. Thanks again, and thank you for visiting Syria. Journalist: I would like you to know that this is a symbol of our victory. Today is the 9th of May. Our parents and grandparents kept water here. This is the holiest thing. 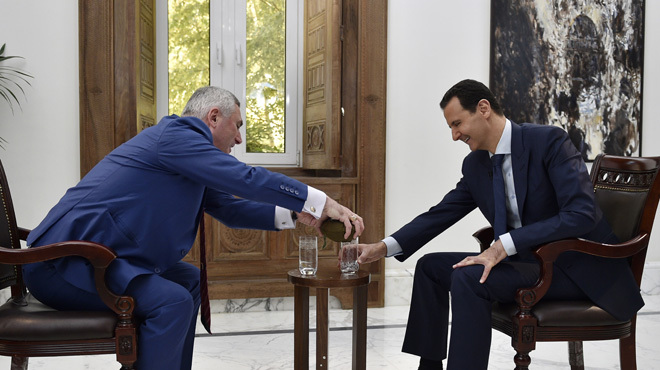 I asked one of my colleagues here to fill it from one of the sacred water springs near Damascus, and today I will symbolically pour this water for you now. This water bottle is from Belarus and the water in it comes from the spring which was occupied by the terrorists three times. As you know, water is the symbol of life. I want the long-awaited peace to prevail on your good land, the land of paradise, and that no Syrian family should need food and water again. May God bless you. It really tastes nice. President Assad: Water is a blessing, because it is a gift from God, but this water that you drank from al-Fijeh water spring specifically has an added significance because it was mixed with the blood of the Syrian fighters in their battle to restore water to every house in Damascus. Millions of people were deprived of this blessing for long months, because of the siege imposed by the terrorists. We drink it in the hope that the blood of those heroes, the fighters of the Syrian Arab Army, is not spilled in vain, but rather to restore water, electricity, and safety to every house in Syria.